Microsoft Co-Founder Paul Allen's Bitterness Shows In Memoir, 'WSJ' Says : The Two-Way The book's "critical portrait" of Bill Gates "has created a rift" between the men, the newspaper says. Gates says their recollection of events may differ, but he values their friendship and Allen's contributions to their work. In a new memoir, Microsoft co-founder Paul Allen claims that his partner Bill Gates schemed to take some of Allen's shares in the company, The Wall Street Journal reports. And, according to the Journal, "woven throughout the book is a bitterness Mr. Allen expresses for not receiving more credit for his work throughout his career and more shares in Microsoft." Gates, in a written statement, tells the newspaper that "while my recollection of many of these events may differ from Paul's, I value his friendship and the important contributions he made to the world of technology and at Microsoft." Gates (left) and Allen (right) became friends when they were young. 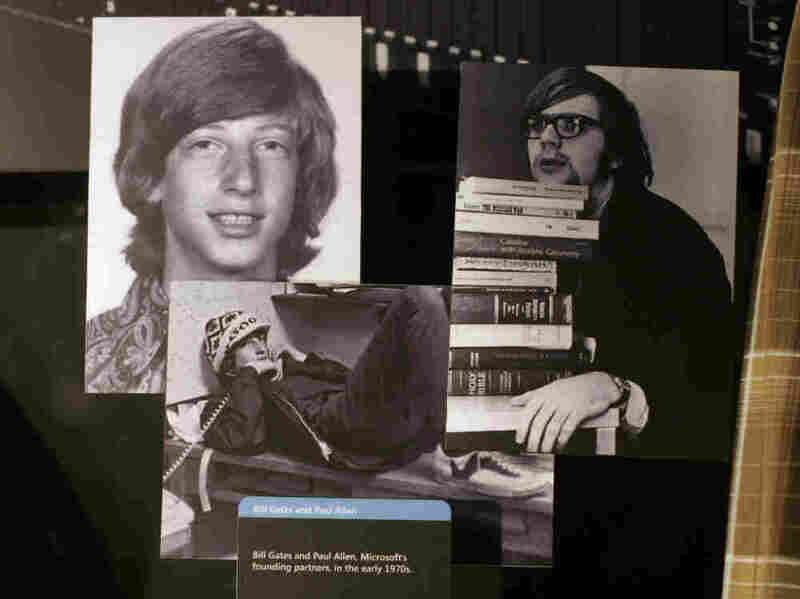 Microsoft's visitor center included photos of them taken in the early '70s.